A side sleeper needs his or her mattress to feel neither too soft nor too firm to relieve pressure points, help align the spine, and conform to the body’s shape even when turning or tossing. Read on to find out how side sleepers can finally get a good night’s sleep with the Brentwood 10” HD Memory Foam Mattress. Side sleepers get the short end of the stick when it comes to having sufficient and restful sleep but that’s not really because of the position which they sleep in but because of the type of mattress they sleep on. A side sleeper shouldn’t buy just any mattress. It has to be one that is medium firm and has a medium feel. 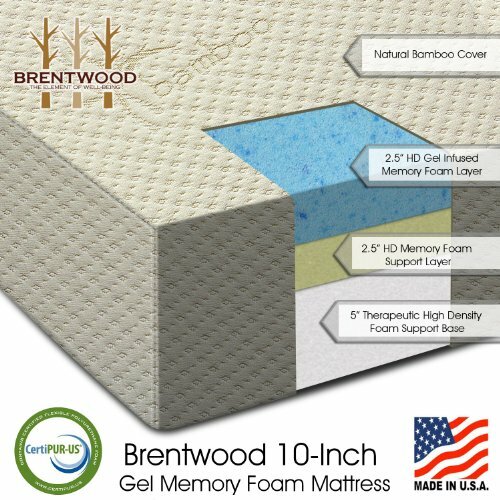 The Brentwood 10” HD Mattress has 2.5 inches of memory foam that easily conforms to whatever body shape the sleeper has, relieving pressure points and aligning the sleeper’s spine to ensure that he or she wakes up without any soreness or pain in the back, neck, lower back, and shoulders. Contrary to popular notion, a firm mattress translates to disaster for a side sleeper because the body’s pressure is mainly on the side sleeper’s shoulders and hips. A firm mattress is unable to give adequate support to these areas because they push back on the body and prevent a natural spinal alignment. This ten-inch high density (HD) Brentwood mattress hugs the body instead of pushing against it. This model is your best bet in terms of sleep quality because of its ability to provide full body support for your needs. Take a look at its numerous features to find out if this may be worth your while. • Hypoallergenic, resistant to dust mite, and anti-microbial. • Measures 10 inches with a 2.5 inch-layer of HD memory foam and a 7.5-inch base layer for therapeutic support. • Dimensions are 38 inches by 75 inches by 10 inches. • Designed with open air technology that enables air to freely flow through to make the mattress comfortable and cool. • Eliminates any potential motion transfer while in use. • Mattress is delivered compressed and rolled, saving money on shipping cost and handling. • Reduces the possibility of turning and tossing while sleeping. • Made from natural high grade bamboo fibers, the washable zipper cover is removable as well. • Conforms to the body’s shape to relieve pressure points and help in aligning the spine properly. • Comes with a warranty of 25 years. • Mattress is certified CertiPUR-US meaning it contains no lead, banned phthalates, CFCs, mercury, formaldehyde, heavy metals, PBDEs, ozone-depleting or low emission (VOC) components. • Compliant with flammability standard 16 CFR 1633 set by the federal government. • High quality materials because it is made wholly in the U.S.
• Sound and restful sleep is guaranteed because of the comfort it provides the sleeper. • Memory foam’s HD quality ensures that it conforms to the user’s body shape no matter what position is assumed during sleep. • Especially beneficial to side sleepers since the spine remains aligned. • Mattress molds the shoulders and sides of side sleepers to prevent soreness or pain in these areas when they wake up. • Upper and lower back have adequate support during sleep. • Ideal for individuals who have just undergone back surgery. • The price may be prohibitive for some, especially those on a budget. • Some customers reported that it did not expand to the full 10 inches as advertised. There is no doubt that the majority of those who purchased the Brentwood HD have been satisfied with the product. Some reviews expressed worry that temperature may be an issue with this mattress because of the absence of gel in the foam. No current owner has complained about heat retention with this mattress, however, so it is safe to say that temperature is not an issue here. Side sleeping customers praised this mattress for having the exact medium firmness that they badly need for their hips, necks, and shoulders which are the body areas most susceptible to pressure points during sleep. While some customer reviews mentioned the price of this mattress as being on the expensive side, other reviews pointed out that for the benefits which it provides, the price is well worth it. This mattress is actually cheaper than others in the same class and similarly-purposed. Incidentally, the gel memory foam version of this model is a little more expensive. If you are a confirmed side sleep who has yet to experience a good night’s sleep that is uninterrupted by wakefulness because your mattress just does not feel right, this mattress, as mentioned earlier, would be perfect for you. Wake up without the soreness or ache which you normally have in your upper or lower back when you sleep on this high quality mattress. While the Brentwood Mattress is admittedly on the high end spectrum of mattresses, consider how much you deserve to sleep well after a hard day’s work and you wouldn’t have second thoughts about getting this. Eight hours of sleep that are relaxing, undisturbed, and comfortable is possible with this mattress.